When it comes to news, anything related to the Russian military is hot right now—there are even many headlines claiming how the U.S. should fear the Russian Navy. These pieces often take “brochure” capabilities as fact without looking at the bigger picture. 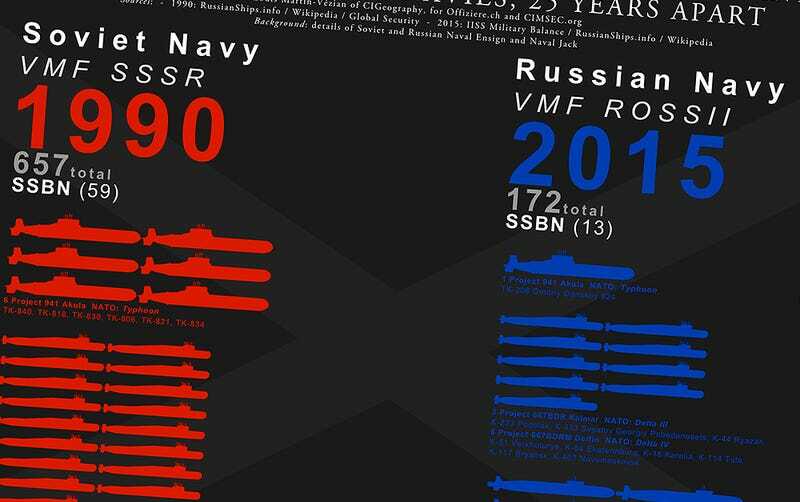 This infographic gives us an idea of just how tiny the Russian Navy is compared to the end of the Cold War. Modernization is underway, but at a slow pace. You can see the whole graphic in high resolution here. And to see many other awesome info graphics we have posted before, click here. As you can see, even 25 years after fall of the Soviet Union, Russia’s current Navy is a fraction of the size of predecessor. Many of the same ships that served decades ago—some of which were not necessarily new then—continue to serve today. Even with Russia’s recent efforts to modernize its naval capabilities, it will take many decades to replace the aging hardware they operate today, yet alone expand the size of their force in a significant manner. And although some concepts like the menacing-looking Lidar class super-destroyer, which has only been seen in model form and is still supposedly almost half a decade from starting construction, look impressive, they remain just that—concepts. Yet even though not a piece of steel has been laid, some in the defense media are treating these “paper combatants” as if they were sailing today. Even Russia’s far less ambitious Admiral Gorshkov class frigate has been slow to arrive in Russian flotillas. In fact, just one of the type is in service today. The fact of the matter is that Russia will have a hard time when it comes to fiscally realizing its far-reaching military modernization efforts, and cracks in its plans are already showing. Like Russia’s air force, this is not to say that Russia’s Navy does not remain a serious or blunt threat to anyone who opposes it. But the idea that it possesses anywhere near the level of capabilities and ability to fight as an integrated force as the U.S. Navy is simply wishful—or should I say, fearful—thinking. A huge thanks for our friends at CIG Contemporary Issues and Geography and Louis Martin-Vézian of Offiziere.ch for continuing to produce such awesome graphics.